Fifteen-year-old Jess is on a road trip to the end of the world. Her evangelical father has packed up the family and left their Montgomery, Alabama, home behind to drive west in anticipation of the rapture, hoping to save as many souls as possible before the imminent Second Coming. With her long-suffering mother and her rebellious sister Elise, Jess hands out tracts to nonbelievers at every rest stop, Waffle House, and gas station along the way. Through sticky diners and in crowded motel pools, beneath bleached bedspreads and in the backseat of the family car, Jess and Elise whisper and squabble their way across the country. But as doomsday approaches, Jess can't seem to work up any real fear about the apocalypse when her sister's secret pregnancy and their increasingly frayed parents loom so much larger. In this fresh and razor-sharp debut novel, teenage angst and evangelical ardor make a pilgrimage across an endlessly interchangeable American landscape of highways, motels, and strip malls. Sporting a "King Jesus Returns!" t-shirt and well stocked with end-times pamphlets, Jess makes semi-earnest efforts to believe but is thwarted at every turn by a string of familiar and yet freshly rendered teenage obsessions. From "Will the world end?" to "Will I ever fall in love?" each tender worry, big and small, is brilliantly rendered with emotional weight. Mary Miller reinvents the classic American literary road-trip story, reviving its august traditions with the yearning and spiritual ennui of twenty-first-century adolescence. As the last day approaches, Jess's teenage myopia gradually gives way to a growing awareness of the painful undercurrents of her fractured family. 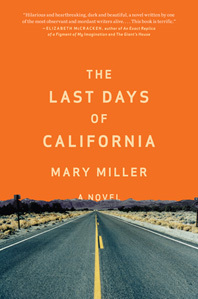 With a deadpan humor and a savage charm that belie a deep sympathy for her characters, Miller captures the gnawing uneasiness, sexual rivalry, and escalating self-doubt of teenage life in America, where the end always seems nigh and our illusions are necessary protections against that which we can't control.